Barrie Crampton will speak about the Perth Military Settlement Mapping Project, a searchable database and map of the original settlement of the area. Barrie initiated the project and is a descendant of one of the original settlers. 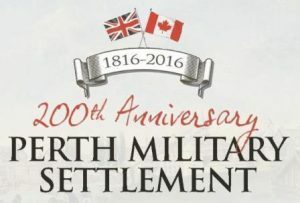 This year Lanark County celebrates the 200th anniversary of the Perth Military Settlement, and the Perth Military Settlement Mapping Project is one of many activities and events. This entry was posted in Meetings and tagged Anniversaries, Genealogy, Lanark County, Perth Military Settlement on March 2, 2016 by Charles Godwin - TSIC.